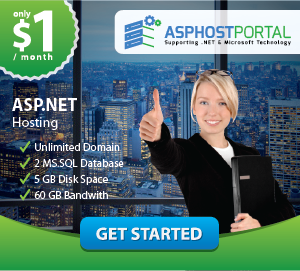 CheapASPNETHostingReview.com | In many ASP.NET Web Form pages, you write code in Visual Basic, C#, or another language. The code editor in Visual Studio can help you write code quickly while helping you avoid errors. In addition, the editor provides ways for you to create reusable code to help reduce the amount of work you need to do. This walkthrough illustrates various features of the Visual Studio code editor. Microsoft Visual Studio 2013 or Microsoft Visual Studio Express 2013 for Web. The .NET Framework is installed automatically. In this part of the walkthrough, you will create a Web application project and add a new page to it. On the File menu, select New Project The New Project dialog box appears. Select the Templates -> Visual C# -> Web templates group on the left. Choose the ASP.NET Web Application template in the center column. Name your project BasicWebApp and click the OK button. Next, select the Web Forms template and click the OK button to create the project. Visual Studio creates a new project that includes prebuilt functionality based on the Web Forms template. 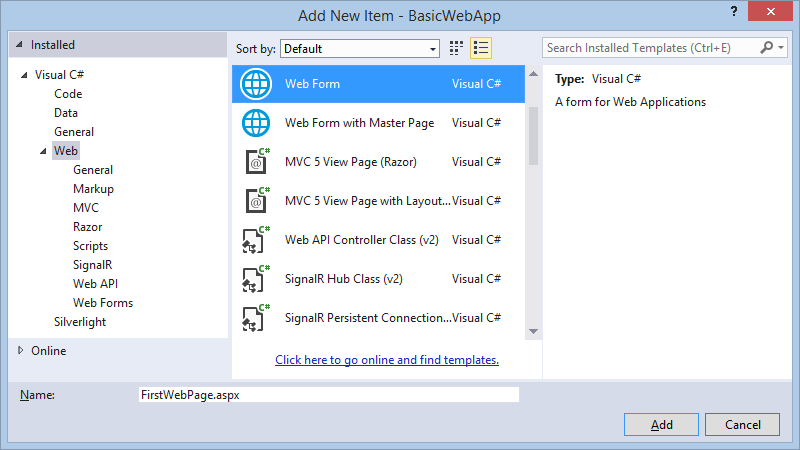 When you create a new Web Forms application using the ASP.NET Web Application project template, Visual Studio adds an ASP.NET page (Web Forms page) named Default.aspx, as well as several other files and folders. You can use the Default.aspx page as the home page for your Web application. However, for this walkthrough, you will create and work with a new page. In Solution Explorer, right-click the Web application name (in this tutorial the application name is BasicWebSite), and then click Add -> New Item. Select the Visual C# -> Web templates group on the left. Then, select Web Form from the middle list and name it FirstWebPage.aspx. Click Add to add the Web Forms page to your project. Visual Studio creates the new page and opens it. Next, set this new page as the default startup page. In Solution Explorer, right-click the new page named FirstWebPage.aspx and select Set As Start Page. The next time you run this application to test our progress, you will automatically see this new page in the browser. The code editor in Visual Studio helps you to avoid errors as you write code, and if you have made an error, the code editor helps you to correct the error. In this part of the walkthrough, you will write a line of code that illustrate the error correction features in the editor. In Design view, double-click the blank page to create a handler for the Load event for the page. You are using the event handler only as a place to write some code. When you press ENTER, the code editor places green and red underlines (commonly call “squiggly” lines) under areas of the code that have issues. A green underline indicates a warning. A red underline indicates an error that you must fix. Hold the mouse pointer over myStr to see a tooltip that tells you about the warning. Also, hold your mouse pointer over the red underline to see the error message. The following image shows the code with the underlines. The error must be fixed by adding a semicolon ; to the end of the line. The warning simply notifies you that you haven’t used the myStr variable yet. Refactoring is a software methodology that involves restructuring your code to make it easier to understand and to maintain, while preserving its functionality. A simple example might be that you write code in an event handler to get data from a database. As you develop your page, you discover that you need to access the data from several different handlers. Therefore, you refactor the page’s code by creating a data-access method in the page and inserting calls to the method in the handlers. The code editor includes tools to help you perform various refactoring tasks. In this walkthrough, you will work with two refactoring techniques: renaming variables and extracting methods. Other refactoring options include encapsulating fields, promoting local variables to method parameters, and managing method parameters. The availability of these refactoring options depends on the location in the code. A common refactoring scenario is to create (extract) a method from code that is inside another member, such as a method. This reduces the size of the original member and makes the extracted code reusable. In this part of the walkthrough, you will write some simple code, and then extract a method from it. Refactoring is supported for C#, so you will create a page that uses C# as its programming language. In the Toolbox, from the Standard tab, drag a Button control onto the page. The code creates an ArrayList object, uses a loop to load it with values, and then uses another loop to display the contents of the ArrayList object. Return to the code editor, and then select the following lines in the event handler. Right-click the selection, click Refactor, and then choose Extract Method. The Extract Method dialog box appears. In the New Method Name box, type DisplayArray, and then click OK. The code editor creates a new method named DisplayArray, and puts a call to the new method in the Click handler where the loop was originally. Press CTRL+F5 to run the page again, and click the button. The page functions the same as it did before. The DisplayArray method can now be call from anywhere in the page class. When you work with variables, as well as objects, you might want to rename them after they are already referenced in your code. However, renaming variables and objects can cause the code to break if you miss renaming one of the references. Therefore, you can use refactoring to perform the renaming. Right-click the variable name alist, choose Refactor, and then choose Rename. The Rename dialog box appears. In the New name box, type ArrayList1 and make sure the Preview reference changescheckbox has been selected. Then click OK. The Preview Changes dialog box appears, and displays a tree that contains all references to the variable that you are renaming. Click Apply to close the Preview Changes dialog box. The variables that refer specifically to the instance that you selected are renamed. Note, however, that the variable alist in the following line is not renamed. The variable alist in this line is not renamed because it does not represent the same value as the variable alist that you renamed. The variable alist in the DisplayArraydeclaration is a local variable for that method. This illustrates that using refactoring to rename variables is different than simply performing a find-and-replace action in the editor; refactoring renames variables with knowledge of the semantics of the variable that it is working with. Because there are many coding tasks that Web Forms developers frequently need to perform, the code editor provides a library of snippets, or blocks of prewritten code. You can insert these snippets into your page. Each language that you use in Visual Studio has slight differences in the way you insert code snippets. For information about inserting snippets, see Visual Basic IntelliSense Code Snippets. For information about inserting snippets in Visual C#, see Visual C# Code Snippets.